A light and lemony puffed omelette studded with juicy blueberries makes an excellent change of pace for breakfast. 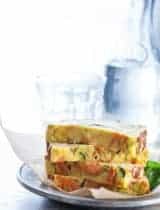 Whether it’s for breakfast, brunch, lunch or even dinner, an omelette is one of those speedy but satisfying dishes every cook should have in their repertoire. 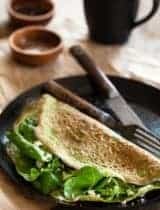 Easy to throw together, it’s also a great vehicle for using up leftovers and always a good choice when you want something nutritious, delicious and satisfying. One of my favorite weekend breakfasts of late is a sweet and puffed take on the classic dish. This fluffy, sweet blueberry lemon puffed omelette adds just a few minutes to the preparation but the result is well worth the extra tiny bit of patience that’s required. Fluffy egg whites and a quick trip to the oven are the secret. For starters the whites are whipped up separately from the yolks for extra lift. 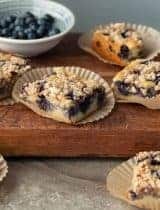 Lemon juice and zest add a fresh zing, and juicy blueberries add a touch of jammy sweetness without veering into dessert territory. In fact, other than the fruit, there’s only 1 ½ Tablespoons of honey to sweeten the entire thing. 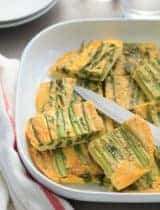 Delightfully light and springy, it has a puffy soufflé-like appeal and a soft and meltingly tender bite. It develops a golden crust under the heat of the oven while maintaining an airy interior with pockets of warmed fruit. It’s that lofty quality that makes puffed omelettes like this one so appealing. 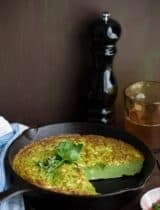 You can serve it warm or let it cool and serve it at room temperature for a brunch. It’s wonderful served with a nice dollop of yogurt on top and fresh berries on the side. P.S. : Be sure to check out this month’s Foodie App Edition: A Month Unprocessed for 31 days worth of whole ingredient recipes. 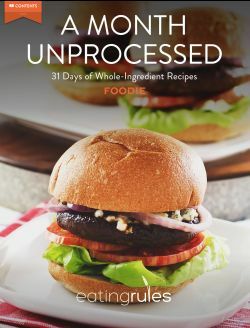 The recipes are a compilation of the best from Andrew Wilder’s October Unprocessed Challenge, where people take the pledge to go for an entire month without eating processed foods. You can download free iOS app here. 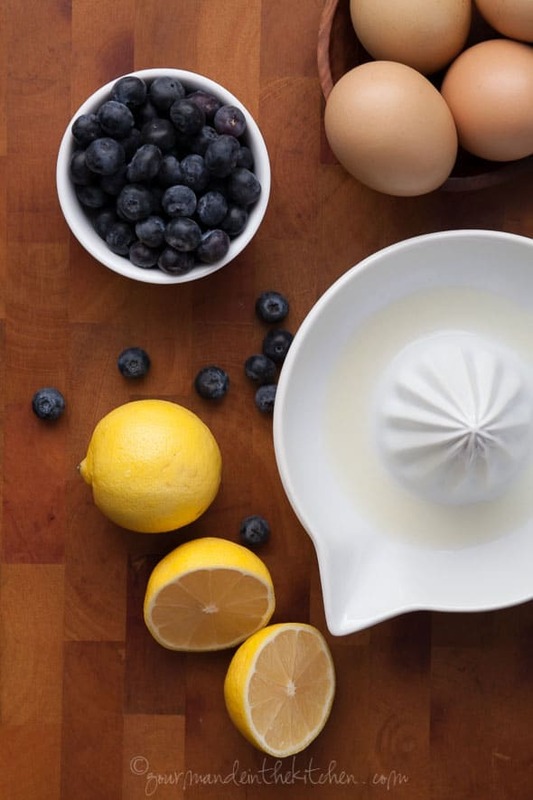 A light and lemony puffed omelette studded with juicy blueberries. 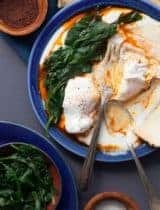 Separate the egg yolks from the whites and place each in a medium-sized mixing bowl . Beat the whites by hand with a whisk or with a hand mixer until firm and fluffy. Add the salt, honey, lemon juice, lemon zest and yogurt to the egg yolks and beat until smooth and fully incorporated. Gently whisk a third of the egg whites in to the egg yolk mixture then gently fold in the rest until incorporated being careful to not deflate the egg whites. Heat the butter or oil an 8 or 9- inch ovenproof skillet , over medium-low heat. Pour the mixture into the skillet (pan will be very full) and cook for 1-2 minutes, just until set on the bottom. Gently sprinkle the blueberries across the top and then transfer skillet to the pre-heated oven. Bake for about 15 minutes, until puffed and browned on top and set in the center. Remove skillet from oven and let cool slightly on a wire rack. Serve warm or at room temperature with a dollop of yogurt and extra fruit on the side. 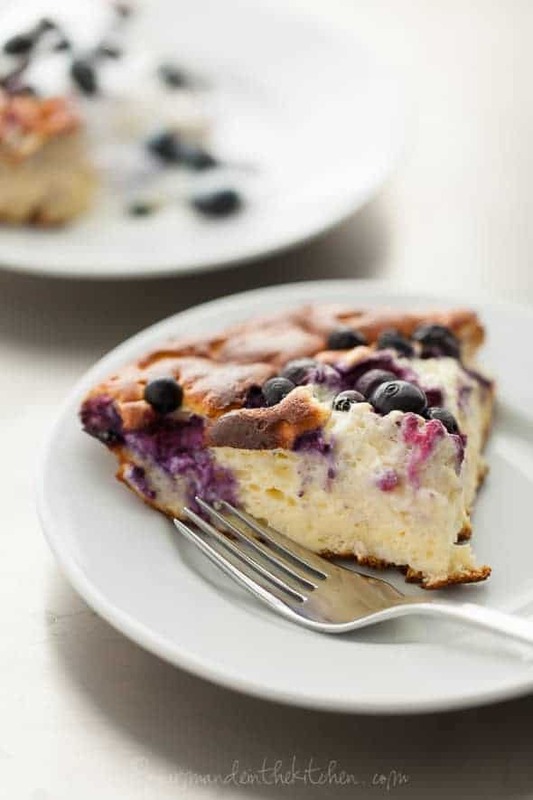 I'd love a slice of this - it looks so light and fluffy! I can't say that I have EVER even heard of a puffed omelette...or an omelette with fruit! But this is so gorgeous that I clearly need to try it. Love the lemon/blueberry combo! Pinned! Coconut oil, honey, blueberries, omg this sounds amazing!! Pinned! How gorgeous! I've never made an omelette with fruit before. I'm so eager to try it now. Beautiful work! 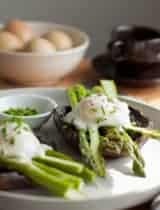 Hi Sylvie, I made this for breakfast this morning, and loved it! The egg separated a bit during cooking, and I liked the effect-- like a crustless lemon meringue pie! What a beautiful idea to marry summer berries with a light fluffy egg custard. Love it! Beautiful photos of a beautiful dish! Love these flavors, such a pretty omelette! oh boy, I wish I could have an slice right now!! Could this be done entirely on the stovetop? I only have burners, no oven. This looks so good! I think that would be possible as well Karen. I would use a 9-inch skillet so that the pan isn't too full then let the bottom set for a few minutes before flipping it over and finishing the cooking on the other side until it's springy in the center. Great recipe! I made this for breakfast yesterday and made a savory version today (sauteed some tomatoes, mushrooms, and spinach in pesto and seasoned the yolks with salt and pepper before layering the egg mixture on top of the veggies with a little parmesan and basil on top). Both ways were light, fluffy, and fantastic. Thanks! Lemon + Blueberries are one of my favorite combinations! I've never thought to throw them in with eggs for breakfast but I like where you are going with this! Love the meringue-like consistency! Looks fabulous! an omelette with blueberries. How clever and how delicious! It looks beautiful and I know tastes even better than it looks! MY this looks amazing!! I was captivated by the feature photo - thinking it was some kind of cheesecake?! The reality is even better...Pinning! I've never seen something like this before. I especially love that souffle look! 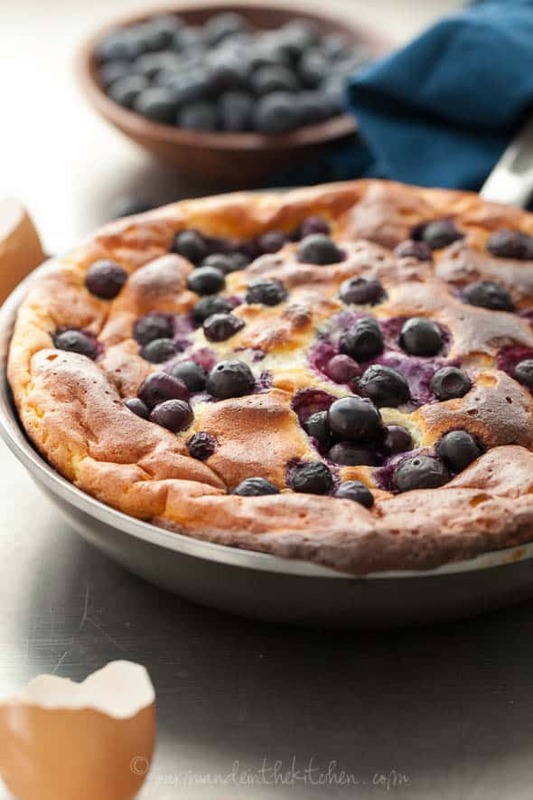 This puffed omelette looks so incredibly delicious, especially with all those juicy blueberries studded into the batter. The best part about this whole recipe is how healthy it is for you too! So thanks for sharing the recipe, you can definitely consider that I will be recreating it. I love the mix of fruit and eggs! This omelette looks so fantastic. If you can find it, coconut milk yogurt is the best option. I like the coyo brand but there are other good ones out there too. If you can't find coconut yogurt coconut milk works as well, I like to add a squeeze of lemon juice to it. Hope that helps!